Best Buy has the LEGO - Star Wars Ski Speeder vs. First Order Walker Microfighters on sale for just $11.99 (regularly $19.99). 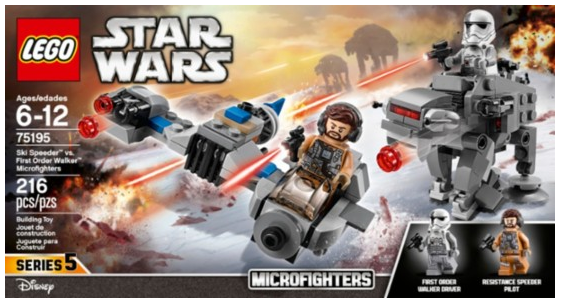 Prepare for ground battle with this LEGO Star Wars Micro Fighters play set. Both the buildable Resistance ski speeder and First Order heavy assault walker have their own stud shooters ready to attack each other. The pilot minifigures of this 216-piece LEGO Star Wars Micro Fighters play set have blaster pistol accessories for added action.